Neil Gaiman's Stardust meets John Green's The Fault in Our Stars in this fantasy about a girl caught between two worlds... two races... and two destinies. Aza Ray is drowning in thin air. Since she was a baby, Aza has suffered from a mysterious lung disease that makes it ever harder for her to breath, to speak- to live. So when Aza catches a glimpse of a ship in the sky, her family chalks it up to a cruel side effect of her medication. But Aza doesn't think this is a hallucination. She can hear someone on the ship calling her name. Only her best friend, Jason, listens. Jason, who's always been there. Jason, for whom she might have more-than-friendly feelings. But before Aza can consider that thrilling idea, something goes terribly wrong. Aza is lost to our world- and found, by another. Magonia. Above the clouds, in a land of trading ships, Aza is not the weak and dying thing she was. In Magonia, she can breathe for the first time. Better, she has immense power- and as she navigates her new life, she discovers that war is coming. Magonia and Earth are on the cusp of a reckoning. And in Aza's hands lie the fate of the whole of humanity- including the boy who loves her. Where do her loyalties lie? LOOK AT THE COVER. JUST LOOK AT IT. LOOK AT IT FOR TWO SECONDS, THAT'S ALL I'M ASKING. Did you see an amazing and spectacular cover, as I did? After reading ACOTAR, I was immersed into this giant reading slump where I tried to pick up several books, but none matched up to the great potential of Sarah J. Maas' new fantasy thriller. 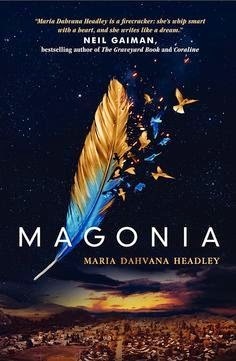 I was compelled to pick Magonia up by the cover and was surprised to say that the synopsis even sounded great and promising, honestly something I was looking forward to. I could tell this book was special, and I was going to enjoy it! The pacing of this book was surprising slow. I would imagine a fantasy book to be pretty fast, with twists and turns at every corner. I didn't feel it with this one and I usually made it only 10 pages at the most, but had to stop and put the book down to do something else. At school, I wasn't overly eager to pick the book back up, which is important because I should be excited about what I'm reading. The pace was disappointing and because of that, I only made it 105 pages in. The characters were off too. I felt pity for Aza because she couldn't breath well and all, but she did little in reaching out to the readers as an enjoyable person when all she did was mope and hope for a better life. Main protagonists and heroines are supposed to be all in for adventure and tenacious! I just thought Aza was a weak character that didn't give me so much to think about. I am in no way badmouthing this book because I commended a few things that the author succeeded in. Headley drew me in with her idea of Aza escaping to a new world to find her voice and breath. I thought the idea was extremely beautiful, just communicated in a weird and awkward way. A synopsis that exquisite should really be accounted for! Magonia is a book all fantasy and other dimensional world lovers should try. It just wasn't the book for me because of the lacking in pace and the weak connection with the characters.